LiqCalc is the perfect App for every vaper! No matter how yourliquid/E-juice is calculated, using the user-friendly interfacewill make the calculation fast & easy! Liquid calculator issuitable for beginners & experienced vaper! With this extensivecollection of tools you will be able to solve all the problems of atypical vaper day. Liquid Calculators Base + Flavor (+additionalFlavors): Mix base with flavors. How much base & flavor do Ineed for a desired amount of finished liquid. Base + Flavor(Advanced): Dilute nicotine base and mix with flavors. Dilute highnicotine base in desired VG/PG/H2O content and mix with flavors.Can also be used for bunker base. Base + Base + Flavor: Mix severalbases and flavors. Calculate the required amount of each componentto get the desired nicotine strength & flavor percentage. Basemixer: Mix bases. Mix different bases into one base. NicotineShots: Various calculators for calculating a mix with nicotineshots. Amount liquid from Flavor: Calculate how much liquid can bemixed based on a given amount of flavor and mixing ratio. Flavorreduce/increase: Change the aroma content. Increase or decrease theproportion of the aroma. Shake & Vape: Mix flavor concentratewith nicotine shots to achieve a desired nicotine strength. ToolsPerformance Calculator: Calculation of voltage, current, resistance& power. Battery Calculator: Calculate your battery runningtime or how often you can pull with your settings on thee-cigarette. Savings Calculator: Calculate your savings compared totobacco consumption. Other Features My Recipes: - All informationat a glance: Total amount, PG/VG/H2O-ratio, base and flavor/s inmilliliters and grams - Save all your calculations - Automaticbackup in your account - Notification function for the steep period- Take a recipe into the respective liquid calculator and refine /change it - Make notes and rate your recipes - Share your recipeswith friends Coil Reminder: - Save your inserted coils - Keep track- when was the coil used, maker, model, resistance, notes -Notification function for coil change We take privacy seriously!LiqCalc requires minimal permissions on your device. We do our bestto comply with the new data protection laws (GDPR). You have fullcontrol over your data. We stay transparent so you can always seewhat's being stored about you. Calculates pressure drop (head loss) of a fluid, in straightcircular pipes due to friction. 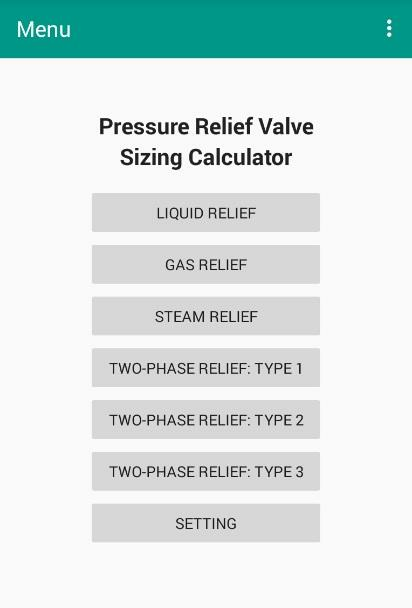 Input parameters for this app ispipe diameter, lenght of pipe, pipe roughness (app includes defaultvalues for widely used pipes), flow rate in several expressions,and physical properties of the flow medium). At first the Darcyfriction factor f,is calculated depending upon the type of flowthat exist in the pipe. So, if Reynolds number is less than 2000(laminar flow), the f=64/Re formula is used to calculate thefriction factor f. If Reynolds number is more than 2000 (transitionor turbulent flow), an approximation of the Colebrook equation(Swamee-Jain equation) is used in order to calculate frictionfactor f. Then Darcy-Weisbach equation is used finally to calculatethe pressure loss.